Jesus commands the evil spirit to come out of the boy and torment him no longer. HE NEXT DAY after Jesus had appeared in glory on the mountain, he came with his three disciples back to the valley where he had left the nine. And he found them surrounded by a questioning throng. As soon as Jesus came near, a man ran from the throng and fell at his feet, crying, "Lord, have mercy on my son; for he is a lunatic, and often he falls into the fire, or into the water. 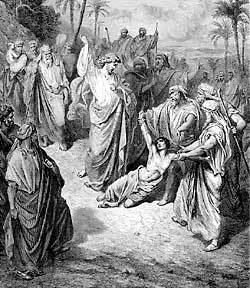 And I brought him to your disciples, but they could not cure him." Jesus was grieved because he saw how little faith in him men had to heal such a pitiful case; for the child was being tormented by an evil spirit, which would throw him down and tear him until he would foam at the mouth and suffer great pain. Now Jesus said to the troubled father, "Bring your child to me." So the man hurried to bring the boy to Jesus. When they came, the evil spirit seized the boy again and threw him violently upon the ground. There he lay in the dust, wallowing and foaming, and all the people were gazing in astonishment upon him. Jesus asked the father, "How long has your son been so afflicted:"
The father answered, "Ever since he was a small child. Often the evil spirit has tried to destroy him; but if you can do anything for us, have mercy upon us and help us!" Jesus saw that this man lacked faith in his power to heal this son. He answered, "If you can believe, all things are possible to him who believes." Then the father cried out, weeping, "O Lord, I do believe; help me to be rid of all doubt." So Jesus commanded the evil spirit to come out of the boy and torment him no longer. Then the spirit gave a loud cry and, tearing the child, came out, leaving him to lie still and unconscious upon the ground. The people rushed up to the place where he lay, and said, "He is dead." But Jesus stooped down took his limp hand, and lifted him up. And the boy rose, and Jesus brought him to his father, a well child no longer to suffer the tortures of the evil spirit. Then Jesus took his disciples away from the people, and they entered into a house alone. Here the nine asked their master, "Why was it that we could not cast out that evil spirit?" Jesus answered, "Because you did not have faith. However, this kind goes out only when you fast and pray." And Jesus talked to his disciples about their need of having faith in God.